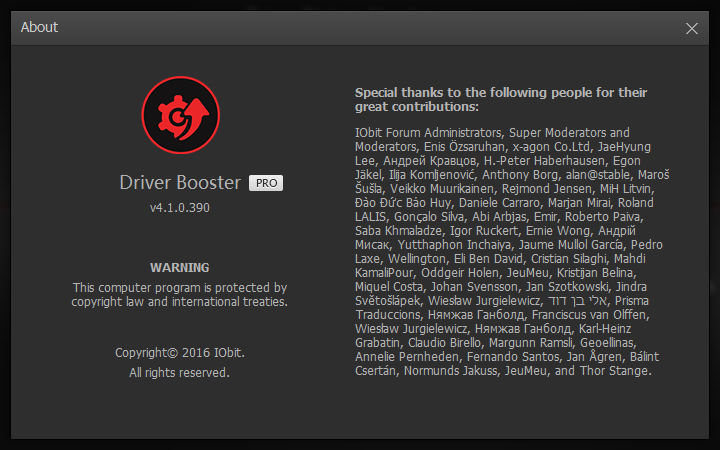 Driver Booster Pro 4.1.0 was available as a giveaway on January 20, 2017! Driver Easy, which by luck was already installed from the earlier GOTD, does not do game components. 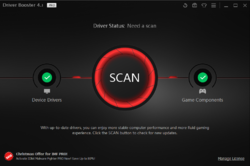 After updating everything with Driver Booster I then did a Driver Easy scan. Driver Easy found two drivers Driver Booster had only just installed, to be out of date! "Hooray! All drivers are up to date!" 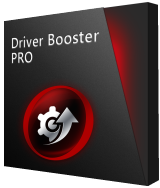 Although Driver Booster 4.2 Pro update is offered by notifications it seems only if you pay! As paying for ver 4.2 would likely have offered the same outdated drivers, I refrained! Having no instability problems so far, (As warned in GOTD posts) I declare Driver Easy the winner! 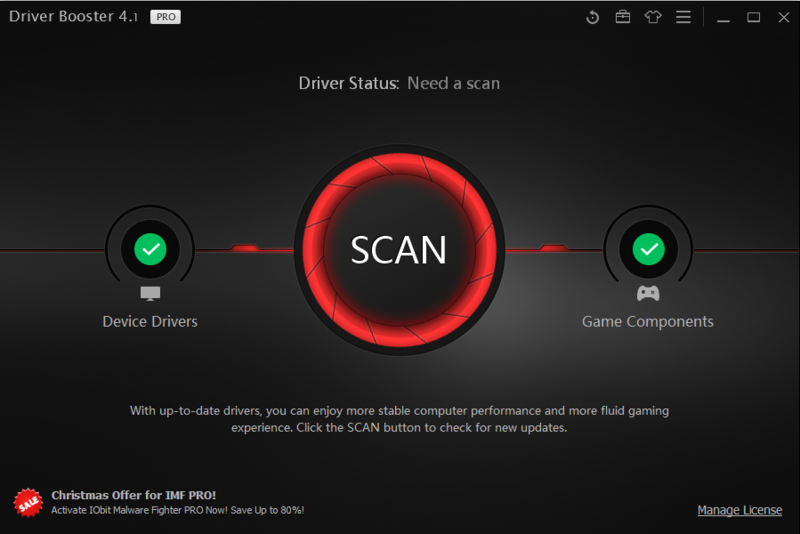 The gaming updates may be useful and to serve as a cross-check, we'll keep Driver Booster Pro too. Hi downloaded an installed fine, however the programme wanted to update but only to the free version not the new Pro version. Anyone else found this problem, how do I update to the new Pro version from the current pro version? "You have to install and activate it before the Giveaway offer for the software is over. To upgrade to 4.2, you have to pay for it. In the readme it says: "You have to install and activate it before the Giveaway offer for the software is over. Terms and conditions Please note that the software you download and install during the Giveaway period comes with the following important limitations: 1) No free technical support 2) No free upgrades to future versions 3) Strictly non-commercial usage" To upgrade to 4.2, you have to pay for it. Same thing as #16. Don't have facebook used e-mail but nothing. No license registration either if could download. Email feature is not allowing software download. I've tried several times and the download link is nothing more than just "blue text". I've downloaded from other websites sending links through email without any issues. I do not like facebook (too much drama), so I will not use it. So how do I download this one year free license for driver booster pro 4.1.0, if not by email? 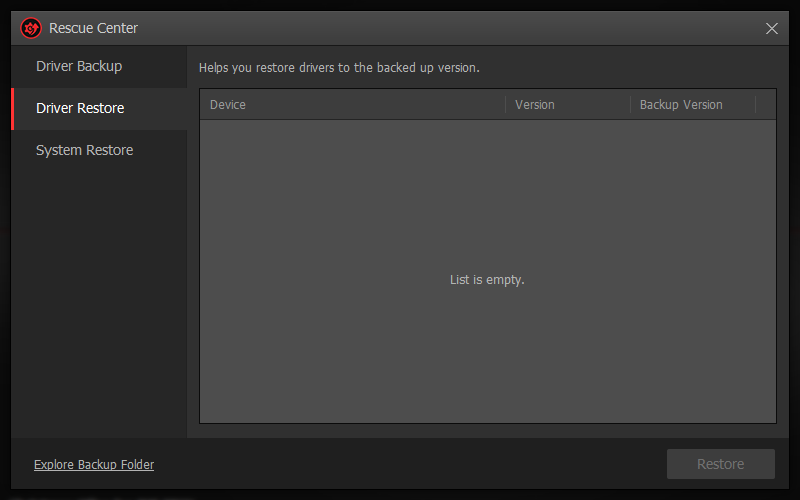 Installed without problems - seems to work great, pulling the officially sanctioned drivers needed for updating. Thank you, GOTD and iOBit. Much appreciated. Snappy Drivers Installer all the way ! I've used the free version of this program in the past to update a few older drivers on a machine that was having problems after a Windows upgrade (specifically with the video drivers). While it did work for me at the time, Iobit is very, very sneaky in trying to install other software programs onto your machine and unless you are extremely alert you could end up with their uninstaller and advanced system care (and a few others) installed on your computer before you realize what is going on. But while this program did help in one case, on another laptop it kept insisting on installing a driver for the touch screen that made the screen non-touch, causing me to have to rewind my machine to an earlier restore date to undo the mistake. I ended up just having to block that particular driver from being scanned and replaced. My conclusion - if you don't have an intimate knowledge of your computer and its drivers it is easy to get in trouble with this program; if you do have that knowledge then you don't need this program. I've used the free version of this program in the past to update a few older drivers on a machine that was having problems after a Windows upgrade (specifically with the video drivers). While it did work for me at the time, Iobit is very, very sneaky in trying to install other software programs onto your machine and unless you are extremely alert you could end up with their uninstaller and advanced system care (and a few others) installed on your computer before you realize what is going on. But while this program did help in one case, on another laptop it kept insisting on installing a driver for the touch screen that made the screen non-touch, causing me to have to rewind my machine to an earlier restore date to undo the mistake. I ended up just having to block that particular driver from being scanned and replaced. My conclusion - if you don't have an intimate knowledge of your computer and its drivers it is easy to get in trouble with this program; if you do have that knowledge then you don't need this program. I installed 4.1 and it told me about the update to 4.2 so I clicked the link and it wanted me to pay for 4.2. I thought this was a 1 year free license. Dave K, Hi same problem, did yu get a response how to upgrade to the new Pro version? For all these Giveaways the offer is only for the given version UNLESS as it's the case in a few cases they state one can update. So DO NOT update as the key is likely not to work, hence your being asked to pay. The current version in this case works fine. Dave, For all these Giveaways the offer is only for the given version UNLESS as it's the case in a few cases they state one can update. So DO NOT update as the key is likely not to work, hence your being asked to pay. The current version in this case works fine. There are two schools of thought about "updating." One is to always update everything and the second is "if it ain't broke don't fix it." It is true that SOMETIMES updating software of any kind will result in undesired consequences. So always set a restore point before updating so that you can undo the most recent change if that happens. It is also true that SOMETIMES updating software (of all kinds) will eliminate pesky little problems you'd grown accustomed to, improve device speed and reliability and/or enable new features. It's been my experience in the last six months using Windows 10 that there have been a large number of updates which have significantly enhanced performance of a number of peripherals. on my W 10 system. I'm guessing that has to do with W 10 being new ... and that it can take time to get the minor bugs worked out. It is therefore entirely possible that many will find updates to drivers with software like this which will produce positive results. Somewhere between "never update anything" and "always update everything" lies a point of sanity. I would strongly advise that one only update one thing at a time. Programs like this might offer you many updates when first run. By updating only one thing at a time you can easily identify which update is guilty if there is a problem. If you update a dozen things in one go and something goes wrong it can be hard to tell which update caused the trouble. Often when "trouble" arises it is not that you have a "bad" driver but rather that your unique combination of hardware and software happens to conflict in a way that never showed up in previous testing. The most obvious expedient if any new software doesn't work right on your system is to revert to the previous version which did work. Run from any driver update software. I just spent 2 days trying to restore 2 computers and when I used this I had to start over. This software will not find the driver you need, just the driver current for the kind of hardware you have. Thus updating past you system's capabilities. Finding the drivers from the manufacturer is the best. 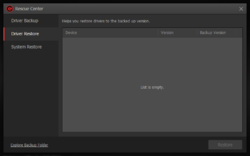 Also I would suggest Unknown Device Identifier Freeware by Huntersoft. This will find everything on your computer so you can update what is exactly installed on your system. Using the free version or the GOTD versions, I've used this program for three or four years now and it's worked well for me. Just my personal perspective; It's not worth $22.95 or $19.95. If iobit wants to sell a lot more licenses they need to drop the price to a reasonable level, e.g. $8.95 or $9.95. Or, even better, make it part of ASC; each year for several years I have bought the pro version of Advanced System Care for multiple devices. Either way, I believe iobit will sell a lot more copies, resulting in much greater annual sales, cash flow, profits. And drop the gimmickry! e.g. it's insulting that you think you can trick me into going to your web page so you can trick me into buying the latest version by clicking the giant button at bottom right instead of clicking the tiny text link to add my license. Iobit is terrible, nasty, horrible at this type of gimmick. Respect your prospective customers; quit trying to trick them. It makes you look like crooks. Using the free version or the GOTD versions, I've used this program for three or four years now and it's worked well for me. Just my personal perspective; It's not worth $22.95 or $19.95. If iobit wants to sell a lot more licenses they need to drop the price to a reasonable level, e.g. $8.95 or $9.95. Or, even better, make it part of ASC; each year for several years I have bought the pro version of Advanced System Care for multiple devices. Either way, I believe iobit will sell a lot more copies, resulting in much greater annual sales, cash flow, profits. And drop the gimmickry! e.g. it's insulting that you think you can trick me into going to your web page so you can trick me into buying the latest version by clicking the giant button at bottom right instead of clicking the tiny text link to add my license. Iobit is terrible, nasty, horrible at this type of gimmick. Respect your prospective customers; quit trying to trick them. It makes you look like crooks. I've been using Driver Booster for years, without causing issues. I'd recommend it, especially for older machines and those who've never updated their drivers. However, to be safe, I'd strongly suggest creating a restore point, and then install only one driver at a time. And reboot after each install. I wonder why it tells me that "not installed" software is outdated. If it's not installed, then I don't need it to be updated. bobo, the aim of IObit is that you BUY their programs. I installed this a few months ago when it was last on offer here on GotD, found it very good and went on to purchase the program. Twice I have requested the free Windows Tweak ebook and as you say, it never arrives. That said I am actually delighted with the program itself. About 10 days ago I reinstalled Windows 10 x64 from scratch. On initial start up Device Manager reported over 60 drivers missing. Driver Booster was set to work on the job - it took a while (15 mins or so) but it found every single one of these drivers and everything seems just fine with what it found. It probably saved me a couple of hours work waiting for Windows to update a few drivers and many others needing tracking down and updating manually. Worth it's weight in gold in my book. Just thought I would share my experiences anyway, for anyone who may be wondering about how safe/useful this utility might be. CJ Cotter, I installed this a few months ago when it was last on offer here on GotD, found it very good and went on to purchase the program. Twice I have requested the free Windows Tweak ebook and as you say, <b>it never arrives</b>. That said I am actually delighted with the program itself. About 10 days ago I reinstalled Windows 10 x64 from scratch. On initial start up Device Manager reported over 60 drivers missing. Driver Booster was set to work on the job - it took a while (15 mins or so) but it found <b>every single one</b> of these drivers and everything seems just fine with what it found. It probably saved me a couple of hours work waiting for Windows to update a few drivers and many others needing tracking down and updating manually. Worth it's weight in gold in my book. Just thought I would share my experiences anyway, for anyone who may be wondering about how safe/useful this utility might be. CJ Cotter, This is NOT true. You can use winrar to open them, even save them for a later install if needed. Just save to a download folder, ( I save my updated drivers in my backup drive), then either reinstall software or open with winrar to install later say after a format. This program is GREAT for people with laptops that do not have driver disks, it will find hardware and get drivers for you. ChrisM, Thank you for your comments. I installed this program a couple of months ago through SoS, and now, through GOTD. Unlike you, twice I did NOT receive the ebook. I had to request it a week later after the first install. What am I to conclude? lovs2build, Hey, thank you for that information! I will try it out the next time this program comes back around. Nevertheless, we should NOT have to use third-party software to unlock and access their backup files. which was causing Windows to hang at random. I highly recommend it. I used this program in the past. It helped me find an outdated driver for my scanner, which was causing Windows to hang at random. I highly recommend it. good, solid and accurate advice. Sadly many won't heed it. levitiquetus, good, solid and accurate advice. Sadly many won't heed it. levitiquetus, You said that you've had troubles with these driver updaters in the past. Excuse me, but this isn't a giveaway of these types of driver updaters. It is a particular one. And since you speak of it as a group, I must conclude that you have no actual experience using it. 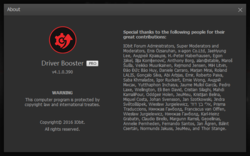 I have used Driver Booster for a couple of years, the free & paid versions from various Giveaway sites with no problem. I have actually used to on diverse machines with OS ranging from Win 7, 8, 8.1 to 10, belonging to different people. Yesterday I helped a friend to update several drivers for a 1 year-old Lenovo noteook, with Win 10 using the free version. I decided to crosscheck these updated drivers with what on the Lenovo support page for the same gadget. So after setting up a restore point, I downloaded all the drivers I could find especially with a publishing date between April last year & Ja. 2017. During installation of the individual drivers, I repeatedly got a warning that the same driver was ALREADY installed for a number of them. That simply meant Driver Booster got them from the same source or they were similar. I have never had any problem with it .... I have never got the impression it gets drivers from 3rd party sources. levitiquetus, I have used Driver Booster for a couple of years, the free & paid versions from various Giveaway sites with no problem. I have actually used to on diverse machines with OS ranging from Win 7, 8, 8.1 to 10, belonging to different people. Yesterday I helped a friend to update several drivers for a 1 year-old Lenovo noteook, with Win 10 using the free version. I decided to crosscheck these updated drivers with what on the Lenovo support page for the same gadget. So after setting up a restore point, I downloaded all the drivers I could find especially with a publishing date between April last year & Ja. 2017. During installation of the individual drivers, I repeatedly got a warning that the same driver was ALREADY installed for a number of them. That simply meant Driver Booster got them from the same source or they were similar. I have never had any problem with it .... I have never got the impression it gets drivers from 3rd party sources. the key will be fine after update, just installed the new version over the old one and version 4.2 still ".pro"
Allan , the key will be fine after update, just installed the new version over the old one and version 4.2 still ".pro"
Unable to install for an unknown reason. Installation Failed that is the messages that I received after trying to install. It suggested that I do a Re-Boot, however it made no difference. Unable to install for an unknown reason. Installation Failed that is the messages that I received after trying to install. It suggested that I do a Re-Boot, however it made no difference. This comes with a 1 year license.......as soon as you install it offers an upgrade to version 4.2 .......will upgrading invalidate the 12 month license or does it allow upgrades during the year ? OK.....nice program having used in the past.....but a question This comes with a 1 year license.......as soon as you install it offers an upgrade to version 4.2 .......will upgrading invalidate the 12 month license or does it allow upgrades during the year ? PaulW, from Terms and conditions: 2) No free upgrades to future versions. PaulW, Hi...I have tried the upgrade and it still shows pro for me. PaulW,.. I already had 4.2 Pro.. opened the zip; copied the code then replaced my 6 month with the new one and it took.. still have 4.2 Pro. fyi, maybe I'm one of the lucky ones but I've used all IObit products for more than 3 years and haven't experienced any problems what so ever.. IObit is top notch. Thanks IObit and GOTD. Good timing perhaps. I had bought 1 yr license & still have ~4months left. But can always use a free year. Cheers GOTD. Good program if you excuse the ads all IObit products are flushed.